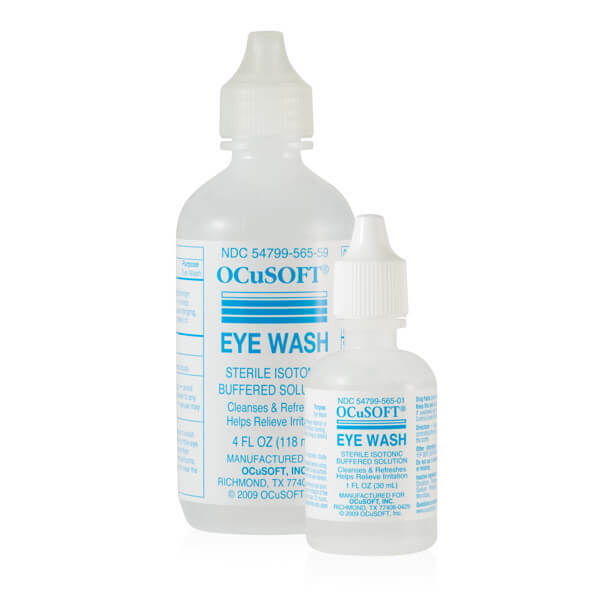 OCuSOFT Eye Wash is an ophthalmic irrigating solution used to irrigate the eye or flush a foreign body from the eye. It is helpful in relieving irritation and cleansing or refreshing one’s eye or eye socket. Available sizes: 1 oz. & 4 oz. I have tried several times to order online but it says there is an error. This eyewash is recommended by my Veterinary Ophthalmologist and I have found it difficult to find at times, even from the manufacturer. Erickson Labs has been my first resource for several years. Product is priced competitively and is always shipped quickly. Always great customer service and I get my orders quickly! The eye wash has help lessen the mucus in my eye. My experience has been a great one. 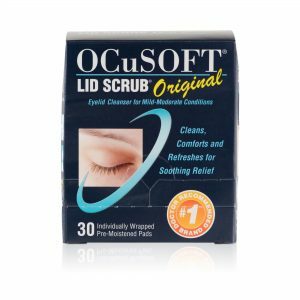 The OCuSoft eye wash is an excellent product. My experience with Erickson has always been positive. Product always arrives timely and well packaged. Always very quick on receiving my items. First of all the ocular does not have an expiration date on it ! What’s up with that? Second it cost you $3.82 to ship this order and you charged me over $7 dollars !!!? Shipping costs were much too expensive. $16 for 2-day delivery that arrived in 4 days! More than 1/2 the cost of the actual product. Doubtful I will be using your retail store again. Like the eye wash for my dog but will find a less expensive substitute. Great product! shipped fast and early too. Wash but was disappointed. I attest and do not hesitate to recommend this great product. Now, it is the only eyewash I will ever use. I really like this for cleaning my eye socket when I remove my artificial eye for cleaning. The bottle that it comes in is pliable plastic and has a tip with a hole in it so you can squirt out the liquid cleaner. My wife loves this wash but it is never available in regular stores. I’ve been ordering from Erickson labs for a year or more and I always have excellent service and quick turn around. The shipping is pretty expensive, but it is always accurate and gets here really fast. Very good product and the service is great. This wash is great, and I love the stream of the nozzle. Prices here are the best I’ve found online and shipping is speedy. No complaints whatsoever. good small to travel with. Have been using this eye wash for many years and it works the best I have tried. I’ve ordered twice from this company, and have been very impressed both times with the service, and with how quickly I receive my order. I will continue to order from Erickson Labs Northwest. I cannot review this item because I did not receive it. I sent an email but got no reply. So glad to find this wash. My son has prosthetic eye and I had to order little bottles where he gets his contact. Shipping charge is ridiculous! Almost the cost of the three bottles of eye solution. Will be checking with doctor for alternative solution to use. My order shipped immediately. Product was in stock so there was no delay in getting supplies that were needed. 2nd order with Erickson Labs. Very satisfied! Received exactly what I odered and got it on time. Would recommend them to anyone who would need their products. I am looking to making a new order with them in the near future. I was surprised to see there’s no mention of artificial eyes on the OCuSOFT bottle, since it was advertised specifically FOR them. From the label it looks like any other generic eyewash for biological eyes or contact lenses. It’s fine as far as it goes, but my former (and sadly discontinued) artificial eye cleaner was formulated especially for plastic eyes, and this isn’t. So I’m not sure if it’s worth the high postage to buy it instead of just getting an overall eyewash locally. Great service, fast shipping, the product arrived in perfect condition! anyone. Easy ordering, and excellent processing and delivery. Thank you. I am very pleased with the promptness of delivery, however I was disappointed that I had to pay double shipping when I ordered 2 bottles at once. I ordered two at a time in order to save shipping costs. Very easy to order eye wash and very fast delivery. I will purchase from Erickson Labs again. Thanks! I simply ordered 3 small bottles of eye wash which was promptly delivered. I see little need for a survey. Requested product not be shipped USPS. It was shipped USPS!!! No one called to see if that would be OK or not. When I called to see what the heck/why, was told that is just the way they ship. Very “whatever” type of attitude from Customer Service. I will consider a different vendor for this product in the future due to their service and shipping options. An excellent and soothing eye wash. I use this several times a day to wash my eye with the prosthetic still in. It helps with the dryness and flushes away protein build up between more substantial cleanings. 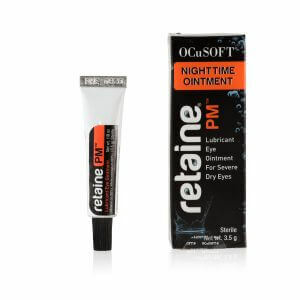 I have been using this product for about 8 months. I am very happy with the product and very happy with the prompt delivery service from Erickson Labs Northwest. From ordering to notifications to shipping to product delivery, Erickson’s system worked flawlessly. The product, suggested by a vet for home pet treatment, was half the price from Erickson than was paid previously from another source. And that includes the shipping charge. Price is good, fast shipping. saved in my places to do future business with. Your company is great, always fast and efficient. My dog was diagnosed with cancer in the left eye, and she is going blind also…..we treat her 3 times a day after surgery. My vet uses this eye wash and it is honestly the best one we have found. Your comopany has always been prompt and helpful.